Sortie France le 15 juillet 2009. When his Parisian armored car holdup goes horribly awry, our protagonist « Black » needs to go on the lam. News from his cousin in Senegal about a stash of uncut diamonds in a poorly guarded bank in Dakar hatches the plan to go on a « working vacation » that involves a little sightseeing and a lot of mayhem. 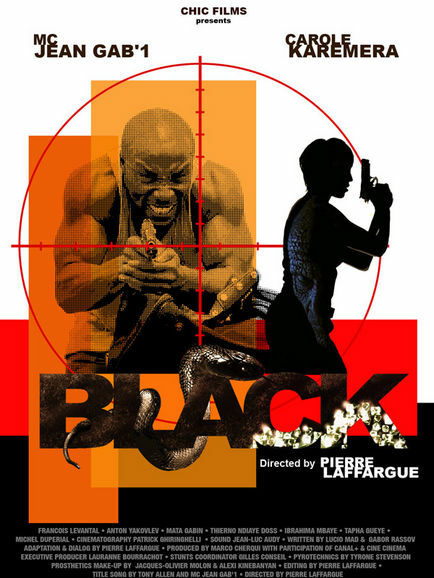 Genre fans know underground French MC Jean Gab’1 as a villain in District B-13, but with « BLACK », he takes center stage and delivers a nouveau-blacksploitation adventure awash in, black magic, African mysticism, mutant arms dealers, gargantuan machete-wielding mercenary armies and a truckload of knuckle-sandwiches.